Syracuse University’s Student Veterans Organization (SVO) will present a documentary film screening on Saturday, Nov. 10, to raise awareness of and destigmatize mental health issues as well as to raise funds toward the sponsorship and naming of a K9s for Warriors service dog for a post-9/11 veteran suffering from the invisible injuries of military service. 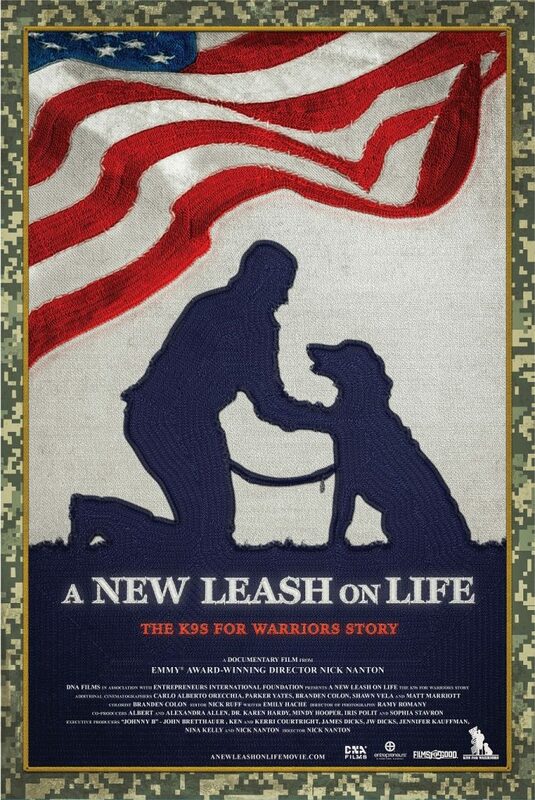 A panel discussion and question-and-answer session will be held at 2:30 p.m., followed by a screening of the documentary film “A New Leash on Life: the K9s for Warriors Story” at 3:30 p.m. Both the panel discussion and screening will be held in Grant Auditorium in Falk College’s White Hall. Directed by Emmy Award-winner Nick Nanton, “A New Leash on Life” has been nominated for four Suncoast Regional Emmy Awards, which will be announced in Orlando, Fla., Dec. 1. Founded in 2011, K9s for Warriors is the United States’ largest provider of service dogs to military veterans suffering from Post-Traumatic Stress Disability, traumatic brain injury and/or military sexual trauma as a result of military service post-9/11. The program is free to veterans, and shelter dogs are recruited for training. As of this month, 489 warriors and 940 dogs have been rescued. The panel will feature three veterans and service dogs who are featured in the film: Louis Belluomini and Star (U.S. Army), SVO President Adam LeGrand ’18, G’19 and Molly (U.S. Air Force) and Shilo Schluterman and Javelin (U.S. Air Force). Other panelists include Carrie Bennett, associate director of development for K9s for Warriors, and Stephen Kuusisto, professor in the School of Education and director of interdisciplinary programming at the Burton Blatt Institute. The event is free and open to the public, but online donations toward sponsorship of a K9s for Warriors service dog will be accepted. Donations may be made on the Syracuse University screening’s K9s for Warriors event page. Suggested donations are students, $5; veterans, faculty and staff, $15; and community members, $20. A $50 donation includes priority seating and a brief meeting with the cast after the screening. A total of $20,000 is needed to sponsor a K9s for Warriors service dog. Anyone who donates online while at the screening can cast a vote for the service dog’s name: Otto, Shemin and Tolley are the nominees. Voting will be held during the event at the SVO’s table outside Grant Auditorium. Additional informational tables will be hosted by Syracuse University’s Disability Cultural Center and Disability Student Union, as well as the Syracuse VA Medical Center’s volunteer service organization. Parking is available in the Irving Garage at a rate of $5.50. American Sign Language (ASL) interpretation and Communication Access Realtime Translation (CART) will be provided. For other accommodations requests, or if you have any questions, contact LeGrand at aslegran@syr.edu or 757.268.1569 one week prior to the event. The event is presented with the support of the College of Visual and Performing Arts.